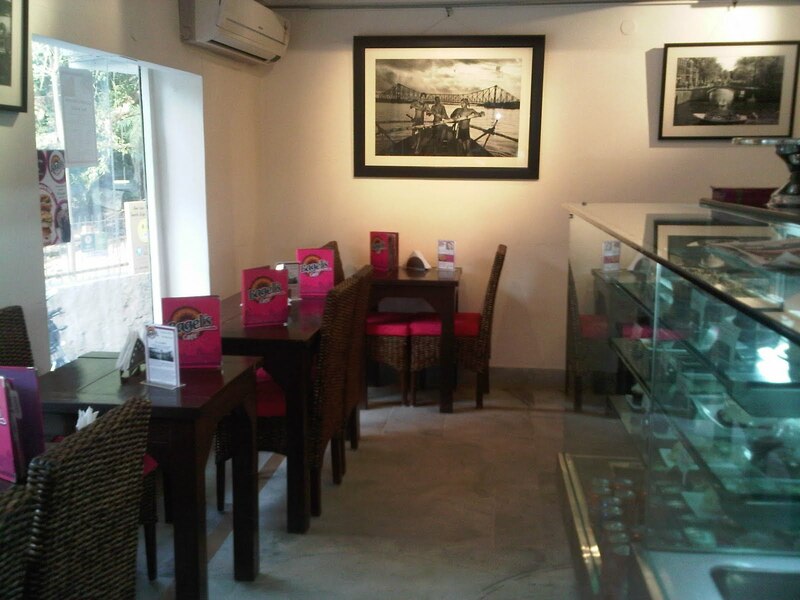 Wandering, wandering, wandering some more through the ever changing HKV. 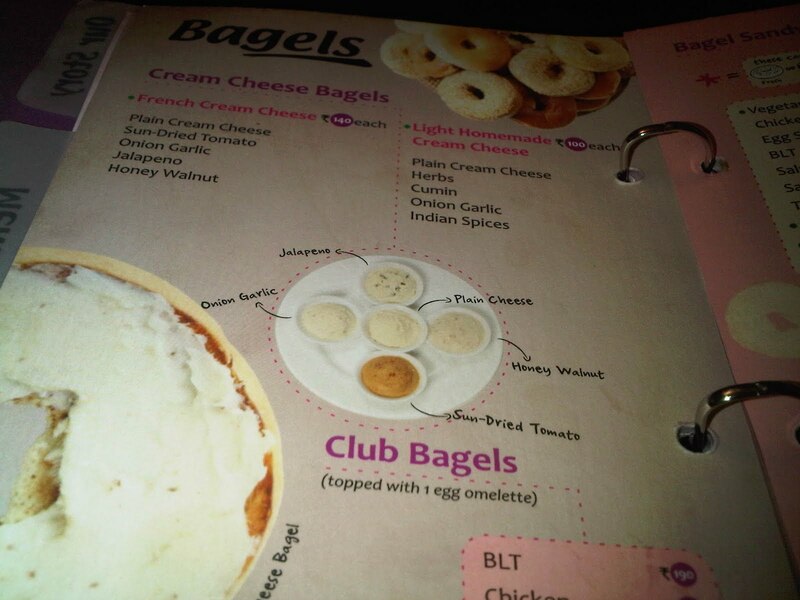 We stumble upon Bagel's Cafe . I was completely ready to ignore it, as it looked like one of those archetypal coffee/sandwich houses that are best ignored. We of course did not end up ignoring it and wandered our way inside. This little place is owned by a Dutch lady who has set up 2/3 other outlets around the city, Defense Colony and Gurgaon being two of them. 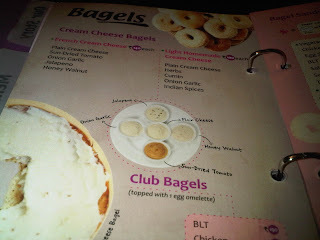 Bagels - Well what ninnies would we be if we didnt try a bagel! So we did... You can pick from a few varieties - at least you should be able to - We of course had the option of two.. I really did expect them not to have half the options, sad it was true. It would have been fun to be able to play around with whatever cheese on whichever bagel but no you can only get plain cream cheese unless you choose to not have any other topping!.. Quite silly... but anyway..
Sesame Bagel w/ Smoked Salmon, Cream Cheese, Capers, Onions - Let me first add I was delighted to see the addition of capers! I was a bit irked about ordering smoked salmon from this generic looking place so I made him show it to me first. Nice healthy pink and smartly kept frozen, so I gave him the nod to salmon my bagel up! The bagel itself, well it was far from perfect, but fresh and fairly tasty nonetheless. A good bagel should be the firm, dense and chewy and this was a bit too soft and fluffy, which might work better for most bagel virgins. A wise Jewish man called Jeffrey Weiss said "Bagel... requires a sturdy foundation. And that means a true bagel is bread with moxie, with chutzpah, with a firm dough and a tough crust. The old joke is that a bagel is a doughnut dipped in cement. The crust of the Real Deal is hard enough to inspire contraptions that allow one to slice a bagel without doing incidental surgery to one's hand." 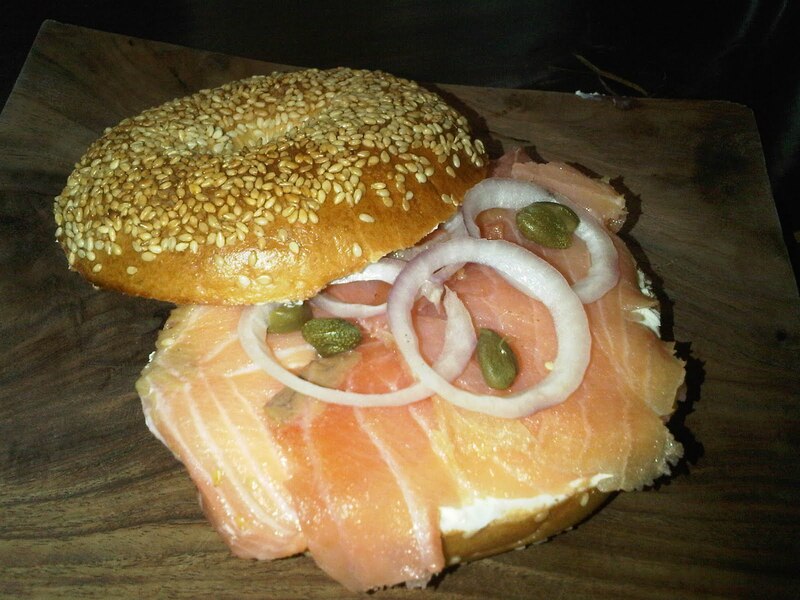 Lets not argue with a Jew about their coveted bagel now please... To sum it up, starved for options we take what we get and I would order it again I love my lox and bagel! Apple Cake - Good! I really like it.. Could have done with more apple and less of that sugar icing. Apart from that it was moist, flavourful and quite delightful. Stroopwafel -Not amazing but not bad. 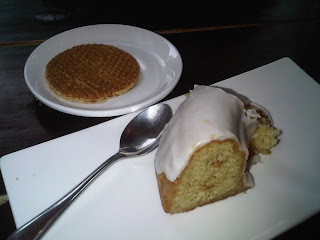 If you like stroopwafels its worth a try. Stroopwafles are two thin waffles sandwiched together to hold some sweet, sticky, caramel in between! And we can thank the Dutch for this winner. These are supplied by Red Moon Bakery. Brownie - I personally quite liked the brownie. Was quite the chocolate explosion. Chocolate Muffin - Not recommended. Dry and tasted weird. Carrot Cake - Nice, moist, spicy, carroty ( Hmm I don't think that translates to much)... This lady really has a sweet tooth because the only problem I had with this one was the layers of cream cheese icing. Now cream cheese icing is a must with the carrot cake but I really thought for the size one layer on top would have sufficed! 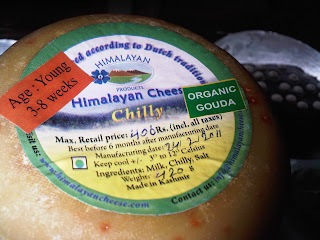 Chilly Gouda Cheese - This was quite fascinating. A Dutch man nestled in Kashmir making Dutch cheese! So "usually" they have more options. But on this day they only had this one.. hmm noticing a bit of a pattern here. We did not end up getting it but I had to share this. Please let me know if anyone of you do end up trying his Gouda. Just a side note - A friend of mine who's taste in food I trust invaluably tried the Defense Colony branch and was very disappointed. She tried the Lemon Meringue and was not a fan. So consistency may be an issue with Bagel's Cafe across branches.